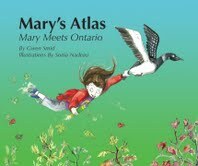 “Mary’s Atlas, Mary Meets Ontario” is actually part of a series of books written by Gwen Smid and illustrated by Sonia Nadeau. The books are an interesting mix of fantasy and real history. The main character, Mary, is a little girl who has a magic atlas. This atlas has the ability to whisk Mary away to different parts of Canada, where she meets unusual characters and has adventures of her very own. In this particular book, Mary is taken to Ontario where she decides to help a loon named Gavi figure out why the Great Lakes are drying up. Everyone wants to blame it on the beavers, but is it really their fault? I don’t want to give the ending away, but I will say it wasn’t what I was expecting. Honestly I was expecting that the story would take an environmental turn and talk about global warming, but I was pleasantly surprised to see that the author found her own creative solution to the problem in the story. I also really liked how the author incorporated famous Canadian landmarks and historical facts into the story without slowing down the pace too much. At the end of the book there is also a list of additional interesting places in Ontario that weren’t mentioned in the story. Whether you happen to live in Canada or not, this is a fun series that your kids will enjoy. The best part is, they won’t even realize that they are learning geography and history at the same time! To learn more about the Mary’s Atlas series, please visit www.marysatlas.blogspot.com.